The DI Andy Horton crime novel FOOTSTEPS ON THE SHORE, by Pauline Rowson hailed as a detective novel in the tradition of Rankin and Harvey, has been re-launched in e book format and on Kindle and Kobo. Footsteps on the Shore is number six in the Inspector Andy Horton crime series of currently fourteen with Dead Passage the latest Horton mystery being published in paperback and as an e book in October 2018. Footsteps on the Shore begins on Friday the thirteenth with DI Andy Horton waking to find his Harley has been vandalized and his nit-picking boss, DCI Lorraine Bliss, has returned early from her secondment to HQ. Then, convicted murderer, Luke Felton, released on licence, is reported missing and a decomposed corpse is washed up in Portsmouth harbour. But before Horton can get a grip on either case, he’s called to a house where a woman he’d only met the day before has been brutally murdered. Is missing Luke Felton the prime suspect, or is it his body in the mud of the harbour? Horton is under pressure to get results, but things are about to get much worse for the beleaguered detective. 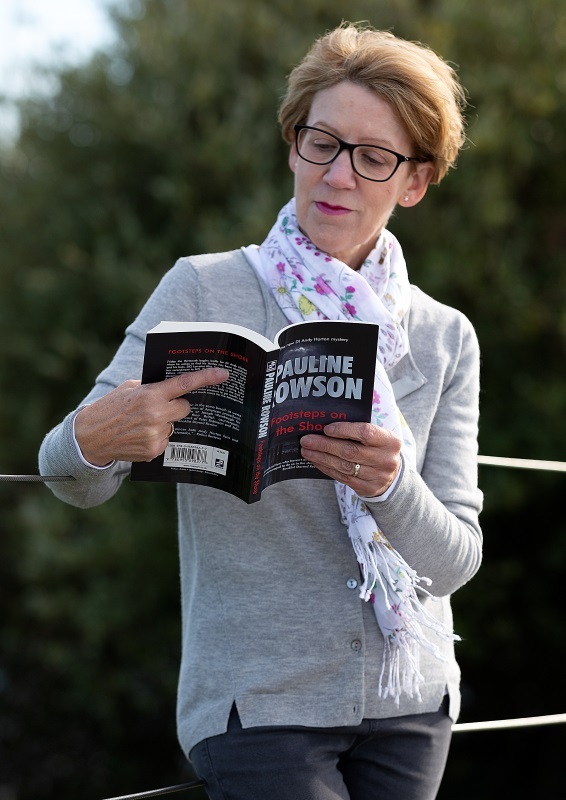 Pauline Rowson is the author of nineteen crime novels, fourteen in the Inspector Andy Horton police procedural series; three Art Marvik mystery thrillers and two standalone thrillers. She is also the author of the murder mystery play set in 1940, Murder at the Pelican Club. Her crime novels have been translated into several languages and are also available in libraries in the UK, USA and Commonwealth. Footsteps on the Shore is available in paperback, as an e book, on Amazon Kindle and on Kobo and as an unabridged audio book. Read more about each DI Andy Horton novel.